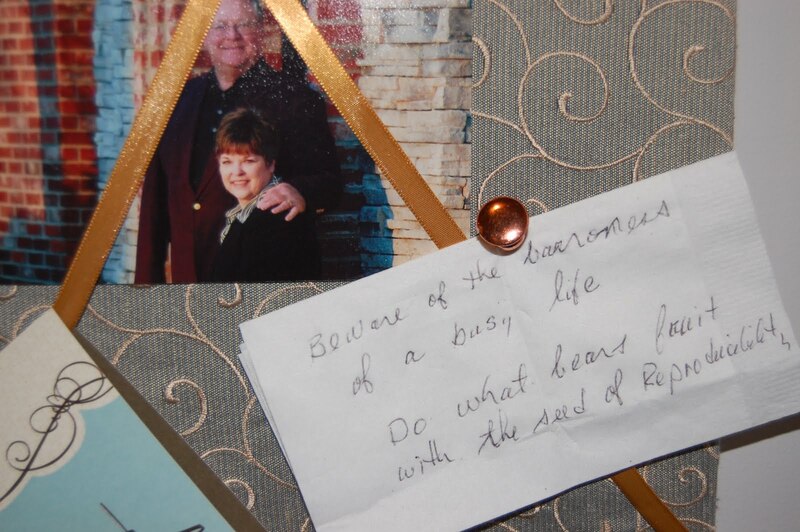 This is a snapshot of the bulletin board in my office. Yes, that’s a napkin… Almost a year ago my hubby & I were at lunch with our spiritual mom and dad (in the pic above) and in the course of conversation Pops started writing on a napkin. I thought it important enough to put in my purse that day, important enough to hang on my bulletin board for almost a year now. And now, this week, those words of wisdom have returned to the forefront of my mind. But it’s hard! It’s hard to stop, to rest, to breathe. We run and go and do and where does it get us? Burned out. Washed up. Tired. Sick. Barren. God, save me from such a life! I want growth, seeds, children (spiritual, not physical mind you! ), and valuable long lasting Kingdom altering results! Jesus said my life is to bear fruit. Fruit with the seed of reproducibility. But when I don’t abide in Him all my busyness is in vain. It seems to me we often times have it all backwards. We fill our days, schedule our lives, and then stop for a moment to ask God to bless the work of our hands. Abiding should be our preeminent goal. Above all else. We should guard it as if our lives depend on it… because they do! Then, and only then… do what bears fruit. Thank you so much for this powerful word and for sharing your heart. What a gift your words are. I really needed this today!